Now that March is coming to a close, we say goodbye to many things; the end of the snowy days, St. Patrick’s Day and all of its festivities, the first day of Spring and, of course, Q1. This year’s Q1 brought more of the same in the way of business. Sure, our restaurant marketing group might have had to work a little harder coming up with some innovative marketing ideas to include in the restaurant marketing plan, but all in all, it was a busy holiday season followed by a slow January and February where many of us took the time to reflect, recover and regroup. Now that the warmer weather is on its way in and the trees are budding, our thoughts turn away from seeing the first robin of Spring and begin to focus on the coming influx of business that the warmer months bring. Warm days bring people out of their homes and into our restaurants. Whether they choose to dine inside the restaurant or out on the patio, customers will seek out their favorite restaurants again looking for updated menu offerings or some of their old favorites. 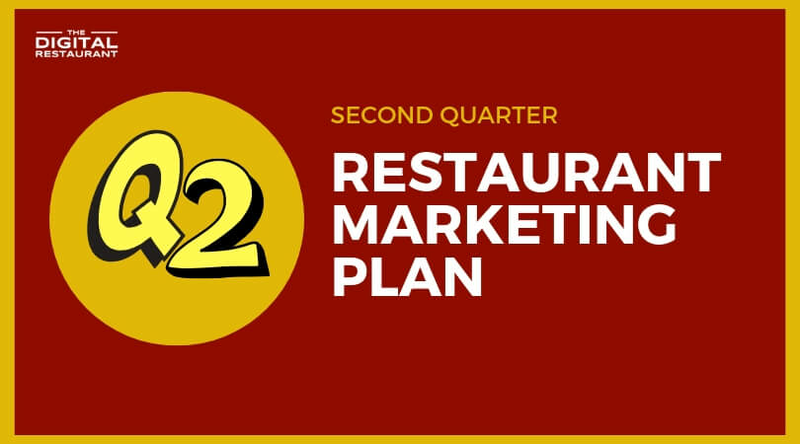 As a restaurateur, we begin focusing on our digital plan for the second quarter of the year and begin utilizing those restaurant marketing ideas we have been saving for just this time of the year. Should you just plan for this season and put the rest of the year, including its holidays, on hold? Sure, you have to place a great deal of your focus on the here and now, but while the past holiday season is still fresh in your head, it may be a good idea to start creating a restaurant marketing plan for Q4 of this year. We’ll talk more about that later. With the power that digital marketing possesses, having an effective digital plan for your restaurant is as important as ever. The following steps will help the business and staff get ready for the coming year and make the most of every quarter holds for us this year. Step 1: Firstly, have a digital plan in place. This sounds like a no-brainer, but having a clear and integrated digital plan for your restaurant. The plan will help establish the restaurant’s online presence, engage customers, attract new customers and retain existing ones. The 4 components of a good digital plan can be easily remembered (BEAR). Be Found – How can the restaurant be found when customers are searching online, how to increase the visibility of the business and how to establish a local presence that stands out among the competition. Engage – How do we engage with my customers effectively, so that our restaurant is on the top of their mind when they decide to dine out. Attract – How do we attract new customers. Do we have an effective strategy to attract millennials to our restaurant? Retain – How do we bring back our existing customers more often. How do we increase our customer loyalty and repeat business. Though the digital plan should have all the above components included, we need to identify the one or two areas that we need to focus on. The focus would depends on what the business needs currently or specific plans for future. This brings to our next point – a digital audit. Step 2: Perform a digital audit. A digital audit will not only give us information about the restaurant’s online presence and social media engagement, but it will also show what our business online reputation looks like. The audit also shows which promotions worked and which ones didn’t the past year. This obviously needs that we have tracking enabled for the past promotions and we are able to retrieve the key metrics data such as opens and redeems. The digital audit will also get you the relevant data you need to make informed business decisions for future quarters. If you would like to schedule a complementary strategy session, click here. Step 3: Shift focus to Spring promotions. Start with a promotions calendar template (Contact us if you want one). This will simplify planning and scheduling special events, promotions and annual sales. Digital advertising is a big part of your restaurant marketing plan and it should be evaluated annually to ensure that you are receiving the highest return on your investment and that your ads are placed where your customers are looking. This brings us to our next topic, the ads themselves. A good digital marketing campaign will include a variety of online ads including ads posted on social media channels such as Facebook, PPC ads and a range of other online options that will let you target a specific customer base. Groupon is another avenue that, when used properly, can help your restaurant become very successful this quarter. If you have used Groupon before and received mixed results, try it again. You might see an improvement in customer response and restaurant bottom line. Step 4: Scaling the restaurant business capabilities. Spring is the season where everything is new again, so why not make the changes and upgrades you have been holding back on now? Maybe you want to add online ordering and delivery or the latest tableside ordering methods; there is no better time than now to do so. Before you start implementing the new capabilities, perform a business capability assessment to ensure that your investment in the restaurant is well justified. Remember me mentioning holiday planning? Right now is the perfect opportunity to look forward to the 4th quarter and begin planning special holiday promotions and events. Look back at last year and see what worked for you. Could it be improved on? If the answer is yes, start planning that now. If last year’s holiday promotion was so successful that it doesn’t need any improvement, leave it alone and focus on the digital marketing side of it. Let more people know about the promotions and you will see even more holiday business this coming year. To summarize what we have just talked about, we need to place great emphasis on Q2 as it is one of the most important quarters of the year. Why is Q2 such a strategic opportunity? In Q3, we are already too busy implementing other ideas for the coming holidays. In Q4, we are already in the weeds with the holiday crowds making any changes futile at that point. Going into Q2 without a digital plan, is like taking the guests’ orders but cooking something else. Work is getting done, but is it the right work? The time is now to initiate your digital plan and create a strong restaurant marketing plan for this year. How is your 2nd quarter plans looking? What restaurant digital marketing ideas are you considering launching during this quarter.